5 stars - "Epson Stylus Photo R2000 Inkjet Printer with CISS" by Joshua Cooper, Written on 2012, 16:02/06/07 Finally found the best device for printing photos. Thank you for your advice. 5 stars - "Epson Stylus Photo R2000 Inkjet Printer with CISS" by Diego, Written on 2012, 12:46/11/27 I ordered Epson R2000. I was surprised by alternative consumable products by INKSYSTEM. You get high-quality outputs and reduce the cost per page in dozens times. Thanx for this opportunity. I was glad with your service and your staff was really polite. Buy Printer Epson Stylus Photo R2000 with CISS and make 30 times more quality prints for the same money! Buy a printer R2000 Epson with CISS and print 20-40 times cheaper! Continuous ink supply system supports the ability to recharge, owing to which printing is even more available! In addition, the ink tanker with the capacity of 120 ml allow to print 15 times more for one filling, than the original 8 ml cartridges do! We also advise you to check similar printer models: Epson Stylus 420W and Epson Stylus S22. Epson CIS Systems from the INKSYSTEM company are made of high quality polycarbonate. This material is resistant to drying and very durable. CISS loop is made of "A1" class silicone characterized by maximum strength and flexibility. The shape of the ink containers meets international standards ISO 9001. The INKSYSTEM company provides a one-year warranty on all the CISS. A wide network of service centers enables high-quality service and repairs as soon as possible. Design of the printer Epson photo R2000 shows the already mentioned likeness very significantly. The similarity of the body shape is easily observed, however, the new model has a smaller size (and is, incidentally, a little much weight). The traditional color scheme of case also remains the same. On a dark surface there is light gray stripe. The main design difference is the in the ease of usage. The control panel of the printing device is not on the top (like by its predecessor), but on the front site. You can buy a Epson printer R2000 and control printing through not three or even not four buttons. Control is provided to you by as much as 6 buttons! We've tested the functionality of the buttons, and the survey shows that the buttons enable you to switch on or off the device, as well Wi-Fi, to control the status of the network, to check paper availability and to control the amount of ink. There's even a special button for paper rolls! Very close to the buttons it is very easy to find 4 LEDs. They show the availability of paper, electricity and ink, as well as the network status. The casing has is matte just like professional photo printers do. This is stylish and practical design tradition. 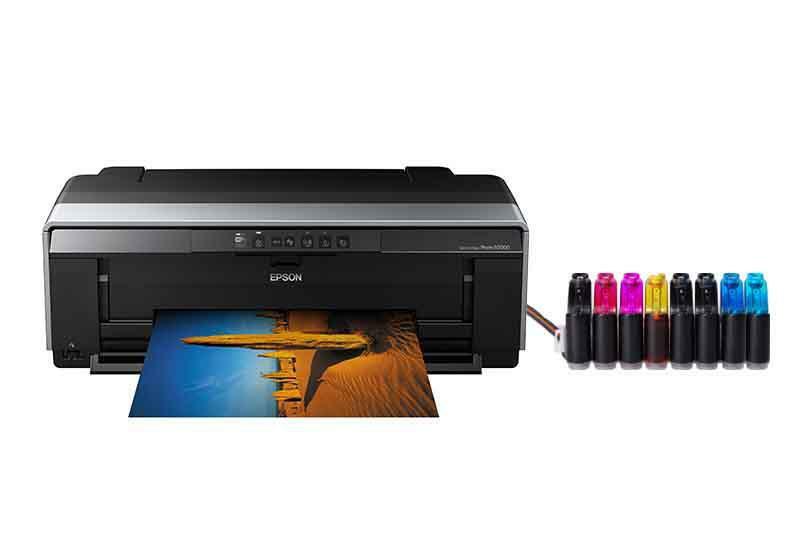 Epson photo stylus r2000 is typical not only for this printer model; the review of all photo printers' models belonging to the R-series from Epson certifies the convenience and practicality of such a coating. The printer has many interfaces. To buy Epson R2000 means to get the opportunity of operating USB Hi-Speed, Ethernet-connector (extremely useful thing, especially when using the device in photography studios) and the wireless connection module. That is, you can buy this printer model - and use the device with absolutely no wires! Furthermore the printer is equipped with the function PictBridge. Thanks to this it can print directly from cameras. The printing device Epson R2000 rigged with telescopic trays (holding up to 120 sheets of media). Paper feeding is usual. The system review has shown that the device is able to work with media whose density is from 64 to 850 g/m2. Having made a decision of buying Epson R2000, you will get a roll paper holder, a tray of CDs, a power cable, of course, and installation guide CDs with drivers and software in the set. And a genuine professional under the hood! The printing system Epson Stylus R2000 printer is 8 ink tanks and a Epson Micro Piezo print head, which sprays ink droplets with a minimum volume of 1.5 pl. All this is identical to the features of the nearest predecessor. A set of eight colors is a CMYK-standard (Cyan, Magenta, Yellow and Black), completed with red and orange (for better skin tones), black paint for matte pictures and gloss. The driver detects the type of black color automatically, depending on the medium. The eighth printer's reservoir contains gloss. This is a transparent polymer improving print quality on photo paper. What does this paint make? It creates a perfectly smooth surface of pictures. Due to this light reflection is improved significantly. Professional Review shows that the machine copes with proofs printing. The color reproduction is perfect! What speed? Manufacturers indicate only the time of issuing an A3-print. According to official assurances the printer Epson Stylus photo R2000 is to cope with large-format photo printing during 235 seconds. The new model Epson photo stylus R2000 turned out well. The printing device with honor continues the good tradition of its series. Buying a printer of this model means ensuring yourself ideal quality of printed photos, as well as decent speed. In addition, the new system, as shown by the review, is very practical while being used thanks to the neat matte covering and a variety of interfaces. The cost of prints is also far from being the best as such printers with CISS are not produced and the original cartridges are too expensive, especially for large-format printing in big volumes. But you can buy r2000 epson offered with compatible continuous ink supply system and print economically while maintaining the excellent printing quality. Finally found the best device for printing photos. Thank you for your advice. I ordered Epson R2000. I was surprised by alternative consumable products by INKSYSTEM. You get high-quality outputs and reduce the cost per page in dozens times. Thanx for this opportunity. I was glad with your service and your staff was really polite.